The Corner-turning Octahedron is a regular octahedron, of which each triangular face is divided into 9 identical smaller triangles, three to a side. A move consist of rotating a vertex; either just a tip (one triangle to a side) or a larger part (two triangles to a side). 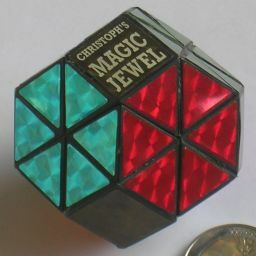 Christoph's Jewel is a very rare version of essentially the same puzzle except that the tips are missing, much like the Tetraminx is a Pyraminx without tips. 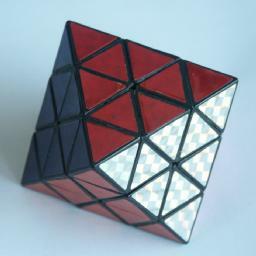 It is equivalent to a Rubik's Cube puzzle without corners, but with the face centres marked to show their orientations. If you understand the solution for the Pyraminx, then you can probably solve much of this puzzle too, because it acts very similar. In Trajber's Octahedron the cuts are a little bit deeper, so that each face also has a face centre piece. These pieces correspond to the corners of the underlying Rubik's Cube, except that their orientation is not visible. The picture above shows a very rare original version from the 1980s, which has one face with gold stickers. It has been remade more recently with different colours. This leaves 12!·210·46 = 2,009,078,326,888,000 or 2.0·1015 positions. If you include the trivial vertex tips then this has to be multiplied by a further 46. 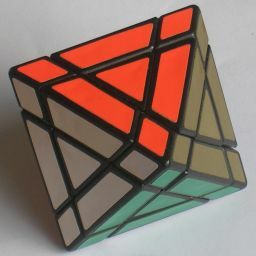 Trajber's Octahedron has an additional 8 pieces. Just as with a Rubik's Cube, only even permutations are possible, so for any given position of the rest of the puzzle, these eight pieces can only be permuted in 8!/2 ways. This gives Trajber's Octahedron 12!·8!·29·46 = 40,503,019,070,029,824,000, or 4.0·1019 positions, almost as much as the normal Rubik's Cube. The vertices are denoted by the letters L, R, F, B, U, D (Left, Right, Front, Back, Up and Down). Clockwise quarter turns are denoted by the appropriate letter, anti-clockwise turns by the letter followed by an apostrophe (e.g. L' means turn the Left vertex 90 degrees anti-clockwise), and half turns by the letter followed by a 2 (e.g.. F2 means turn Front 180 degrees). Since the vertex tips are solved independently from the rest of the puzzle (see phase 1 below) this notation is not applied to tip moves but only to the larger moves. Rotate the tips on each vertex to match the adjacent vertex pieces. Phase 2: Solve vertex pieces. Rotate the F, B, L, R and U vertices so that their vertex pieces match, and only the edge pieces have the wrong colour. The D vertex will be done later. Phase 3: Place the U edges correctly. First find any edge that belongs next to the U vertex. This moves the edge between the F and R vertices to a position between the D and F vertices. Hold the puzzle so that the edge belongs at the front, i.e. at FU. Rotate D to place the piece at the front, i.e. at DF. To move FD->FU do D F2 D' F2. To move DF->FU do D F' L D2 L' F.
Repeat the above until all U edges are at the U vertex. Note that if all U edges are at the U vertex but they are not all correctly positioned, then you can bring one down to the D vertex by using one of the above sequences to displace a U edge. Phase 4: Place middle edges correctly. Find a middle layer edge that lies at the D vertex. Hold the puzzle so that the edge belongs at FR. Rotate D to bring the edge to the DF position. To move FD->FR, do R' D R.
To move DF->FR, do D L D' L'. Repeat the above until all middle edges are correct. Note that if a middle edge is incorrectly positioned, it can be brought down to the D vertex by using one of the above sequences to displace it. Phase 5: Solve D vertex piece. Rotate D until the vertex piece matches the others. Now only the four D edge pieces remain unsolved. Phase 6: Place D edges in position. 2. To move DR->DL->DF->DR, do R' D2 R D' R' D' R.
Phase 7: Orient the D edges. 3. To flip DR, DL, DF, DB, use b or c to flip them two at a time. Hold the puzzle so that there is an incorrect face centre at the DFR face, and so that the face where it belongs lies in the top half, and so that there is at least one other incorrect face centre in the top half as well. This is always possible if there are incorrect centres. If there are only two incorrect centres, then the puzzle has been taken apart and reassembled incorrectly. 1. Find the face that the DFR centre belongs to. 2. Turn the U vertex to bring part of that face to the UFR location. 3. Do R' D' R to replace the face centre piece. 4. Turn the U vertex so that the other incorrect face centre lies at the UFR location. 5. Do R' D R to replace the face centre piece. 6. Turn U back to its original state. Repeat a-b until all face centres are correct.